Our company employs a team of engineers, having expertise and experience in manufacturing fully automatic strapping machines. The specialties of this horizontal oriented machine are its compactness, easy mobility, energy saving mode, which triggers after 2 min when it is not in use, also it has 20 seconds of warm up period and quiet intermittent action control. With the work table height of 830 mm, it is possible for the operator to easily operate. 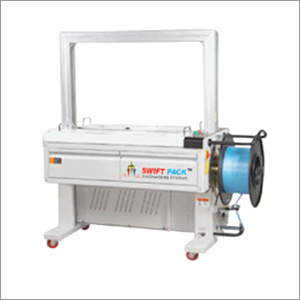 The fully strapping machines are fabricated using high grade electrical components and the machine is covered in stainless steel frame. The 235 kgs machine has 1420X650X1565 dimensions, 800 x 600 mm maximum strap size, 80 x 50 minimum strap size, 2 strapping speed, 9-15 strap width, and 25-700 strapping force.